This peak is #10 in Prominence List for Alaska .A glaciated stratovolcano located near the southwest end of the Alaska Peninsula. The Pavlof Volcano is one of the most active volcanoes in Alaska with its latest eruption in 1997. The largest recorded eruption occured in 1911. Access is by boat to Pavlof Bay via the nearby village of Cold Bay, which is a stop on the Alaska Ferry system. 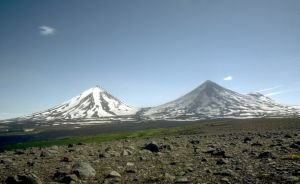 The mountain is typically climbed from the west but can be easily ascended on skis from other directions.